Just after the turn of the new year, the Forest Stewardship Council (FSC) posted this news release – calling attention to the publication of an updated version of a document entitled The Development and Revision of FSC Normative Documents (FSC-PRO-01-001 v.3-1). FSC has had a “procedure for writing procedures” for many years. This is just the latest of many versions. We think it is significant to mention because – in spite of the best of intentions – FSC staff continue to find it difficult to follow their own protocols. A long, long list of major policy changes are underway, and the careful processes FSC has designed to manage them are falling rather short. Those of us who are trying to follow along are baffled, bewildered, and behind. 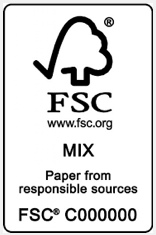 FSC’s document-writing procedures are (for the most part) well-conceived and (we believe) well-intended. When they are implemented carefully, they seem to work reasonably well. Unfortunately, this has not been the case recently, and policy and standard development has become rather chaotic. Here are two important examples that deserve our attention right now. After 5 years of work, FSC released the latest update to its important Controlled Wood (CW) standard just over a month ago. MixedWood provided an analysis and review of the new document in our last post. If you missed it, please click back and take a look. One of our sub-headings reads: “Information Gathering – no surprises here”. It turns out that we were mistaken. 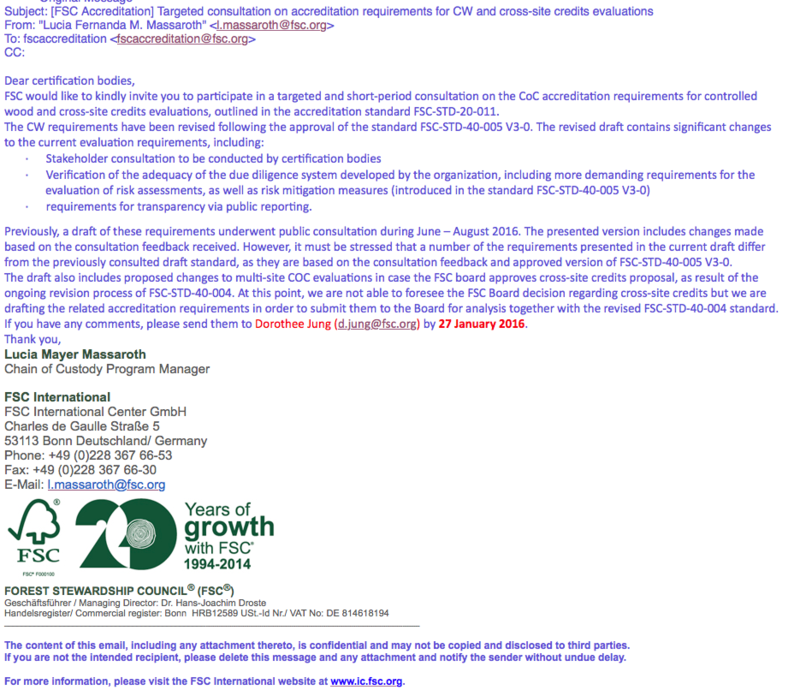 Last week, FSC released one more standard update draft – this time to the accreditation standard for CoC. Here is a link to the announcement. It was narrowly directed only at Certification Body (CB) staff, and requested a very quick response. This document is entitled Chain of Custody Evaluations (FSC-STD-20-011), and provides rules which apply to Certification Bodies (CBs) for the conduct of Chain of Custody (CoC) and Controlled Wood (CW) audits and certifications. Currently this standard is in version 2-0. The new, proposed draft will be version 3-0. Had the update to the 20-011 been a minor one, this informal review may have been reasonable. But this update is not minor. The new draft (v.3-0 Draft 1-0) includes an entirely new, very detailed set of requirements for evaluating Controlled Wood companies. 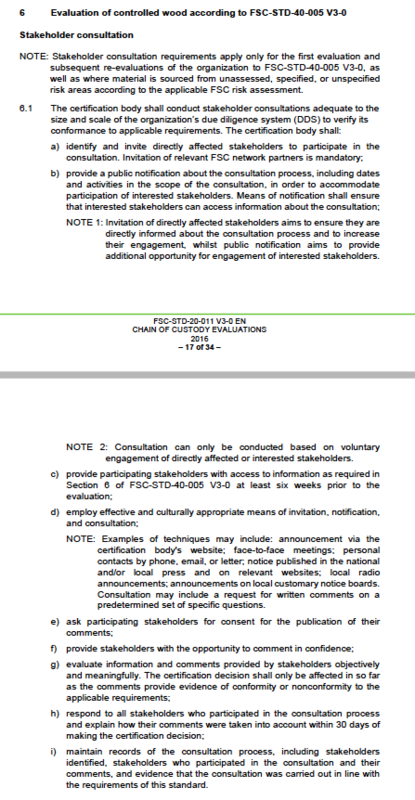 7 pages in length, this new section introduces an entirely new set of Stakeholder Consultation requirements (Section 6 on pages 21-27) which will fall directly on Certificate Holders (CH), that have never been publicly discussed before. We do not know whether these new requirements will survive the drafting and review process. We are dismayed, however, that such a significant change to the conduct of the CW program is being contemplated without any consultation with implementing companies. It will be greeted with alarm when CW companies finally see it. If your company relies on Controlled Wood (or if your suppliers do), we strongly urge you to read this draft and let FSC know what you think of it. In spite of some minor modifications (in Notes at the beginning), we are certain this will prove to be an important mistake. When FSC CW-certified companies learn that this important, challenging, and very expensive new requirement has been applied without any notice, they will be dismayed. The other important FSC policy process that is active this week is the ongoing revision of the main Chain of Custody (CoC) standard (FSC-STD-40-004). The last, publicly-available discussion draft (V.3.0 Draft 2-0) was released early last fall, and reviewed by MixedWood in October. The final decision on these remaining items is being referred directly to the FSC Board of Directors (BoD), who will be asked to act on them this winter. The new standard could then be ready for publication as soon as March 2016. The greatest importance, and greatest risk, is – of course – attached to the last of these items: Transaction Verification. It is very clear that this topic remains controversial, and very unpopular among certified companies. It seems to be promoted principally from among the FSC staff. MixedWood remains convinced that this remains an ill-considered idea that is best discarded. It appears likely that the remaining, important decisions about the future of FSC Chain of Custody lie with the Board of Directors. We encourage our readers to contact them directly to share their views. We urge the BoD to remember that Chain of Custody must not be allowed to become a weight and burden on the FSC program. When in doubt, we must try our best to simplify. UPDATE2 (8 Apr 2016): We also learned that the “final” round in this long, long story was not final after all. FSC decided they need one more draft and (at least) one more round of consultations. Here is the announcement. Here is a link to the ongoing standard development process – now over 3 years in process. Here we go again. A South African colleague once shared an old proverb about how best to eat an elephant. The answer – of course – is one bite at a time. Everyone seems to agree that FSC’s vast array of normative documents has grown to at least the size of elephant, and threatens to keep growing and eventually trample us all. How can we finally begin to “streamline and simplify” the FSC program? The answer is both challenging and obvious: one bite at a time. We think it is time to get started. Do you agree?